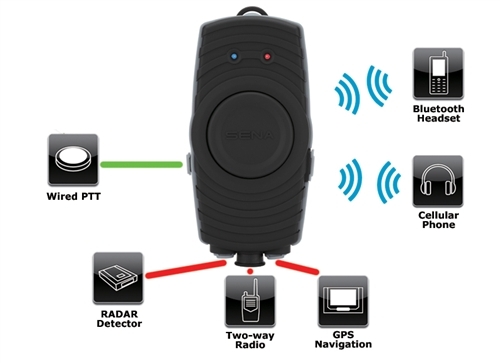 Along with SR10, you can talk by phone or by two-way radios at the same time, listen to alarm signal from radar detector and listen to the guides from GPS Navigation. The SR10 covers such a various application areas as motorcycle group riding, outdoor sports and activities or security. The SR10 has two AUX ports for non-Bluetooth devices such as mobile phones, navigation devices, radar/laser detectors and other audio devices. The SR10 provides mobile phone access to users through the wired AUX port or by Bluetooth handsfree profile. 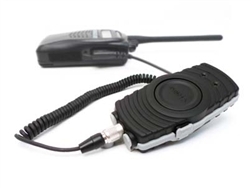 The SR10 supports two-way radio devices in the market by using optional cable accessories. Kenwood, Icom, Motorola, Yaesu, and Midland. Other than two-way radio devices specified, the optional open-end cable is provided as well for custom cabling. One of the greatest features of Sena products is the ability to charge on the go. Many customers take part in long distance rides as well as use features such as the intercom, GPS, and music throughout a ride which can shorten battery life. Being able to charge while riding allows the adapters to always be ready and available no matter how long the trip lasts. This is important when the unpredictable could happen and staying connected is essential. Sena customers have the option of registering their products which will allow for updates regarding new firmware options. Firmware upgrades allow Sena’s products to always operate at their peak and have the most up-to-date functionality and options for rapid technological advancements in smartphone and Bluetooth device. The firmware upgrades are available for free when available to all registered Sena customers.